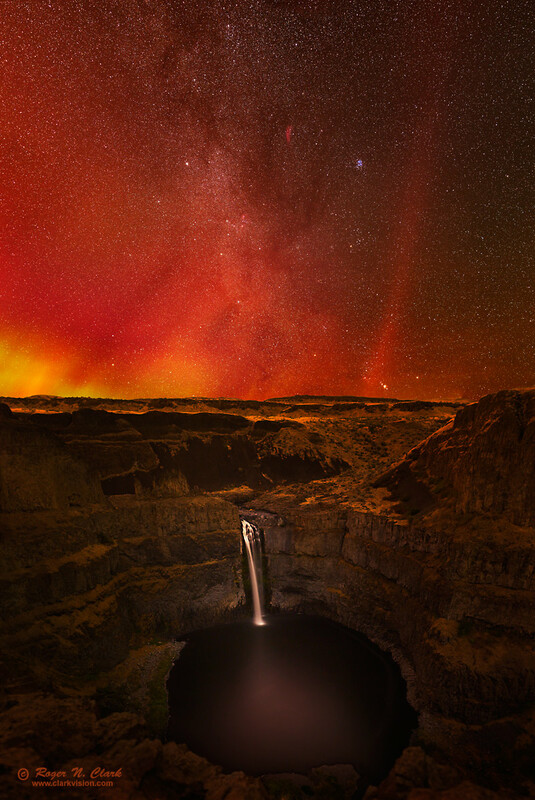 Palouse falls is a beautiful waterfall in eastern Washington State, Unites States. I planned a nightscape at this location for months, waiting for late summer so I could get the Milky Way and Orion rising in the early morning. I was fortunate that on my first night arriving on scene that it was beautifully clear. As usual these days some other night photographers were on scene and had hiked to the bottom of the falls. They were constantly firing off flashes ruining the solitude and destroying photography for anyone else. That is why I planned this image for early morning because most other photographers have usually left. This image was obtained around 2:20 am on September 11, with the constellation Orion just rising in the east. But I was fortunate to have one of the best auroras in the western U.S. outside of Alaska of this solar cycle to occur this very same night. The sky erupted in dancing red and chartreuse green aurora curtains that intensified in the early morning. (The photographers with the flashes missed the whole thing.) Usually aurora occurs mainly in the north, but this view is to the east and east-northeast. That is why the aurora shows increasing intensity to the left side of the image. This scene is all natural light. The light on the land is that from the night sky: light from stars, the Milky Way galaxy, aurora and airglow. The aurora and airglow light are emission line sources, like that from a neon sign. That narrow-band light creates enhanced colors on the landscape. For more on natural color in the night sky see Parts 2a, 2b, 2c and 2d on Color of the Night Sky and proper post processing to show those colors. A strong red auroral band is just to the right of Orion's belt is shining to the top of the image. The red band was obvious visually, and the red and green on the left side of the image were apparent too. Well above Orion is the Pleiades star cluster with its blue reflection nebula. To the upper left of the Pleiades is the small red rectangular spot: the California nebula. Dark lanes in the Milky Way merge with bright and dark bands of aurora, and the red aurora drowns out the Milky Way near the horizon. Technical. Canon 6D 20-megapixel digital camera, Sigma 35 mm f/1.4 DG HSM lens at f/1.4. Twenty exposures at ISO 1600 were made for the mosaic. On the sky, the camera tracked the stars using an iOptron SkyTracker, with 15 exposures, 30 seconds each, then 5 images with 240-second exposures of the land were made with no tracking, with ISO 1600. Daylight white balance for natural color. The full sized image is 13,542 pixels high by 9,046 pixels wide (105 megapixels).